It's our last day of My Creative Time sneak peeks, and Emma's got a few more awesome products to share today! Like I've said, these releases don't just have to be for Valentine's Day projects. I used some of the new products to make a thank you card today! I started with a postage stamp card cut from the Cricut Birthday Bash cartridge, cut at 4 1/4". After layering on a 3 5/8" brown square and a 3 3/8" kraft square, I stamped a sweet sentiment from MCT's Thank You Hugs stamp set. If you don't have this set, add it to your shopping cart. When I just went to link it to my post, I noticed it only costs $3.99! Onto the new products! Today we're sneaking the new Stitched Postage Frame Die. Isn't this the cutest??? I die cut this four times: once to get the patterned paper rectangle, and three times out of Papertrey Ink Canyon Clay cardstock. Layering the frames gave it a cool chipboard element look! Next I used the die from Chocolate Greetings (also being released tomorrow) and cut it once out of brown cardstock and once out of foil. By folding down a little bit of the foil before adhering them together, I've got a little "chocolate" peeking through! The sentiment and the banner it is stamped upon are also from Chocolate Greetings. So fun! P.S. If you watched Emma's video today in its entirety, you saw she had a few announcements in there for you! The MAIN announcement she wanted you all to know is that starting TOMORROW (Monday, December 31st) @ 8 AM PST, you can used the code: NEWYEAR at checkout in her store to get 20% off your entire purchase! Yes, that is even including ALL of her stamps that are 40% off right now here! This sale will end on Sunday, January 6th @ midnight PST! Cute card! Love that chocolate candy... Think I have to have it. With the chocolate peeking out of the top it is just adorable. Katie, sweet little card! Love the colors! What are we all doing up in the middle of the night? Waiting to see the new release. Yeh...lLoving it. Cute card, love the color combination! Super cute! Thank you for showcasing the new release with such an inspiring card. How fun is this!? I love the bit of chocolate peeking through....so clever of you! Very nicely done...thanks for sharing! Cute card. I love how the chocolate is peeking out. Thanks for sharing. Love your card and you are correct, Emma has some awesome prices on her products right now. Creative frame for the foil treat. So cute. I am loving this one. The colors are amazing, and it shows a great non-Valentine project. Love the foil too. TFS! sweet card, do love the choc. kiss!!! Katie, this card is so cute! I LOVE the non-traditional colors for Valentine's Day!! thanks for sharing! can't wait til I can order mine tomorrow! Too cute ! I love the foli on the chocolate drop . Great card ....I want these dies . TFS . So cute! 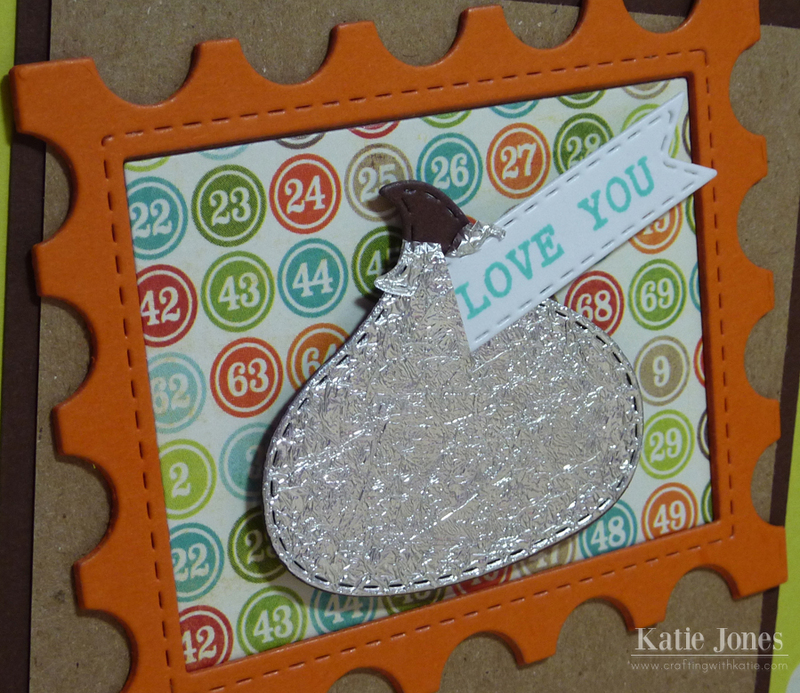 I love the foil kisses! Great looking card and such pretty paper. WHOA I love what you made and how cool is it that you also used a Cricut Cartridge with the postage stamp cut girl this is genius you really rocked your card I love it!! cute cute cute!! I just love that die! Love your card. Love the kiss. Can't wait to order. Love the card. THe glitter kiss is just too cute. Super cute thank you card. Love the kiss die. Again, love your card! love the choc peeking out! So clever! Your card is just sweeeeet....love it! tfs! Great card...love how you have the chocolate peeking through..you always get at least one of those in a bagful!! darling card katie! I love the chocolate peaking through! and the layer of cardstock does look like chipboard! Love how the "chocolate" is peeking out of the foil!!! Great job. I really love the candy kiss card! Thanks for your inspiration! Great card--I like how the chocolate peeks through. The way you have the "chocolate" peeking out of the foil kiss makes it look so real. Fantastic design! You always have the cutest projects :). TFS!! So pretty! What a striking color combo - and LOVE the foil on the little kiss!!! Beautiful job with your card! I really like this postage frame and how you guys incorporate it with other postage frame projects. Great job on your card...I love shape cards. I hope to be near the front of the line tomorrow for the release to make my order. Happy New Year! Very nice thank you card! TFS! Cute, love those colors together! I love love your card!! The kiss is my favorite die!!! Love your card! Such great colors and who can resist that chocolate peeking out of the top of that kiss?! So creative as I've come to expect from you. I absolutely love the way you have the chocolate showing through the wrapper! Love this card. Love this card...great combination of the new dies and stamps. Thanks for sharing. I just love the tone on tone in the You and Me card. Plus I just adore using the brown paper bag color!! Katie ~ Oh look at these FUN colors and papers you used!! LOVE how bright and cheerful these are ~ oh my!! GREAT way to use the dies and stamps ~ as always!!! I must say how CLEVER are you to make your chocolate PEEK out of the wrapper too ~ EEK!!! Awesome job!! !